Please Note – Due to exceptional demand, tickets for Cowland’s are only available to existing Lily Fisheries members transferring venues. Cowlands farm is a mature 5 acre fishery situated near Braintree, Essex. The venue provides the members of the syndicate numerous angling opportunities, whether you prefer to sit behind your rods or stalk in the edge. Although classed as a farm reservoir it was dug for gravel extraction and hasn’t been used for irrigation in years. Soon after the lake was dug it undergone some major landscaping with many indigenous trees planted. These have now fully matured and the venue is a lovely place to wet a line. The lake is situated in a dip so the angler is well sheltered and protected from the full forces of mother nature. 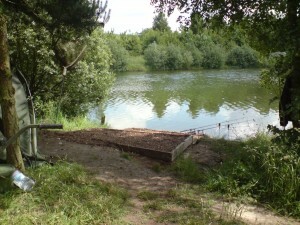 Cowland’s has a multitude of features which makes it an interesting place to fish. The old part of the lake has depths to 15 foot and there are some sharp drop off’s in the margins where the old lake previously was. There are a lot of carp present in Cowlands with untold twenties, around thirty 30lb plus carp topped by a couple of mid forties. There are a number of carp in the very high thirties. Two different 39-06 mirrors came out on the same day over the 2015 xmas holidays, so we are anticipating the amount of forties to rise during 2016.